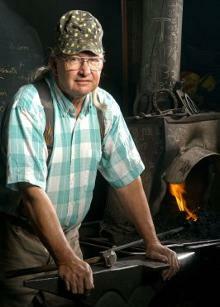 Frank Turley is the founder and operator of Turley Forge Blacksmithing School and a frequent demonstrator at craft schools, regional workshops, and universities. He welcomes the opportunity to present workshops of two days or longer, and will travel to any site that has a forge setup. This Granddaddy of Blacksmithing Schools was established in 1970 making it the oldest of the modern blacksmithing schools. Classes are three week intensives designed for beginning and intermediate. We work in three areas: scrollwork, toolsmithing, and various forms of hardware. Advanced classes can be planned on request. Shorter one week classes are being added. Check our schedule page for details. A brochure is available. Call, write or e-mail for more information. SEND YOUR POSTAL ADDRESS FOR A HARD COPY! Travel: Frank teaches and demonstrates at various schools and events world wide. See schedule for more. NEW! 2018 and 2019 schedule is posted! Start making your plans to attend now! Frank Turley is the co-author of Southwestern Colonial Ironwork with Marc Simmons.